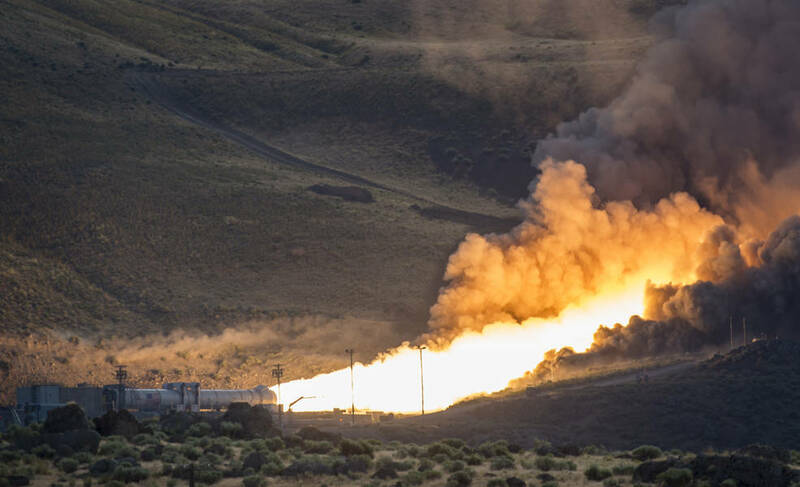 June 28, 2016 – A booster for the most powerful rocket in the world, NASA’s Space Launch System (SLS), successfully fired up Tuesday for its second qualification ground test at Orbital ATK’s test facilities in Promontory, Utah. This was the last full-scale test for the booster before SLS’s first uncrewed test flight with NASA’s Orion spacecraft in late 2018, a key milestone on the agency’s Journey to Mars. Lying horizontally in the test stand, the QM-2 motor is 154 feet in length and 12 feet in diameter and is the world’s largest human-rated solid rocket motor in existence. These boosters produce 3.6 million pounds of maximum thrust, more thrust than 14 747-400 jets produce at full takeoff power. The flame exits the motor at Mach 3 and burns for a full 126 seconds. Orbital ATK and NASA will use test measurements from more than 530 data channels to analyze motor performance, acoustics, motor vibrations, nozzle modifications, insulation upgrades, Booster Separation Motor structural dynamic response and nozzle vectoring parameters. The booster was tested at a cold motor conditioning target of 40 degrees Fahrenheit –- the colder end of its accepted propellant temperature range. When ignited, temperatures inside the booster reached nearly 6,000 degrees. The two-minute, full-duration ground qualification test provided NASA with critical data on 82 qualification objectives that will support certification of the booster for flight. When completed, two five-segment boosters and four RS-25 main engines will power SLS on deep space missions. The solid rocket boosters, built by NASA contractor Orbital ATK, operate in parallel with SLS’s main engines for the first two minutes of flight. They will provide more than 75 percent of the thrust needed for the rocket and Orion spacecraft to escape Earth’s gravitational pull. The first full-scale booster qualification ground test was successfully completed in March 2015 and demonstrated acceptable performance of the booster design at 90 degrees Fahrenheit –- the highest end of the booster’s accepted propellant temperature range. Testing at the thermal extremes experienced by the booster on the launch pad is important to understand the effect of temperature on how the propellant burns. Based on the design heritage of the flight-proven solid rocket boosters used on NASA’s Space Shuttle, the SLS five-segment motors incorporate new technologies and updated materials. Orbital ATK is also providing critical propulsion technology for the astronaut safety system aboard the Orion spacecraft, which includes the launch abort motor and attitude control motor. The SLS, along with the Orion spacecraft, provides a flexible deep space exploration platform to take humans and cargo to multiple destinations across our solar system. The first test flight of SLS and Orion together, called Exploration Mission-1 (EM-1), will be uncrewed and is scheduled for late 2018. During EM-1, SLS will use two of Orbital ATK’s five-segment solid rocket boosters. The initial SLS configuration will have a minimum 70-metric-ton (77-ton) lift capability. The next planned upgrade of SLS will use a powerful exploration upper stage for more ambitious missions, with a 105-metric-ton (115-ton) lift capacity. In each configuration, SLS will continue to use the same core stage and four RS-25 engines. Lockheed Martin Space Systems of Littleton, Colorado is the prime contractor for the Orion spacecraft.